Just three months after Gemini 6 and Gemini 7 proved that two spacecraft could easily rendezvous in Earth orbit (see the November 2005 issue of Boeing Frontiers), Gemini 8 was launched. The goal: to prove that docking in space could be just as routine. Like rendezvous, docking was an essential element of the Apollo plan to land a man on the moon. At 9 a.m. on March 16, 1966—40 years ago this month—an unmanned Agena docking vehicle was launched from Pad 14 at the Cape Kennedy space center in Florida. One hour and 40 minutes later, Gemini 8 blasted off from Pad 19 in hot pursuit. Two flawless countdowns followed by two perfect launchings—all in one day. It was the most spectacular space feat to date. The primary goal of Gemini 8—made by McDonnell Douglas, a Boeing predecessor company—was for mission commander Neil Armstrong to rendezvous and dock with the Agena. In the following three-day period, astronaut Dave Scott planned to conduct two extended space walks. After five orbits, Gemini 8 caught up with the Agena 185 miles above the western Pacific Ocean. The two spacecraft flew in formation for half an hour before Armstrong closed to within a few feet of the Agena over the South Atlantic. As they passed over Africa, Armstrong effortlessly slipped the nose of Gemini 8 into the Agena's docking collar. "Houston, we are docked," Armstrong reported. "It was a real smoothie." For 28 minutes the two spacecraft flew together, forming a single spacecraft with a length of 44 feet (13.4 meters) and a weight of more than 24,000 pounds (10,900 kilograms). But as Gemini 8 and its partner moved out of radio contact above the South China Sea, something went wrong. "Neil, I think we're in a roll," Scott said. Armstrong used bursts from the Gemini maneuvering thrusters to straighten and steady the two spacecraft. But a few minutes later the roll began again, only faster. Concerned that the stress and strain of the violent rolling might break apart the two spacecraft and ignite the Agena's 4,000 pounds of fuel, Armstrong used the Gemini 8 maneuvering thrusters to undock and back away from the Agena. 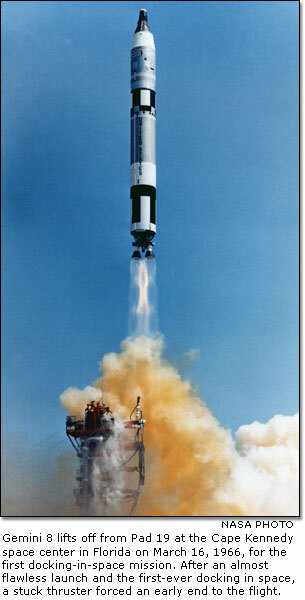 Once free, Gemini 8 began spinning even faster than before, making a dizzying full turn every second. "We've got serious problems. We're tumbling end over end up here," Armstrong reported as Gemini 8 came back in radio range. Dizzy and suffering from blurred vision, Armstrong remained calm. As Gemini 8 tumbled wildly at 17,500 miles per hour, Armstrong decided the problem had to be a stuck thruster. He and Scott shut off each of the spacecraft's 16 orbital maneuvering system thrusters one at a time. Thruster Number 8 did not respond. "All we've got left is the reentry control system," Armstrong told Scott. Armstrong believed those thrusters, more powerful than standard thrusters because they positioned the spacecraft for reentry, would override the stuck thruster. Both astronauts wavered on the edge of losing consciousness. At first, nothing happened. After turning the system off, then on for a second time, the reentry thrusters responded. As Gemini 8 started its sixth orbit, Armstrong and Scott slowly regained control of their spacecraft. It took almost 30 minutes and used 53 pounds of fuel from the reentry control system. Only 19 pounds of fuel remained. If that ran out, Armstrong and Scott would have no way to return home. Mission Control in Houston told the astronauts to end the mission and return to Earth. After determining which of the seven emergency landing areas would provide the safest and fastest reentry path, Mission Control told the crew of Gemini 8 to prepare for reentry during the seventh orbit. The landing site, they said, would be in Area 3, southeast of the Ryukyu Islands in the western Pacific. Immediately, word of the emergency went out to U.S. Air Force and Navy recovery forces stationed in the Pacific. Four-engine Air Force C-54 "Rescuemaster" transports based on the island of Okinawa in Japan headed for the predicted landing area. The destroyer USS Mason, on patrol about 160 miles from the area, steamed at top speed for the landing point. As Gemini 8 crossed once again over Africa, Armstrong fired all four retrorockets to bring the spacecraft back to Earth. During decent, the reentry control system—even the balky orbital maneuvering system—worked perfectly. Unlike previous Gemini flights, this reentry would have no help from NASA's extensive ground-based tracking network. Armstrong worried that they would land in some jungle-covered spot, and a rescue team would have trouble finding them. As they neared landing, all Armstrong could see out his window was haze. He told Scott to look out the right-side window. "Do you see water out there?" he asked. After a few seconds Scott yelled, "Oh yes, there's water. It's water!" 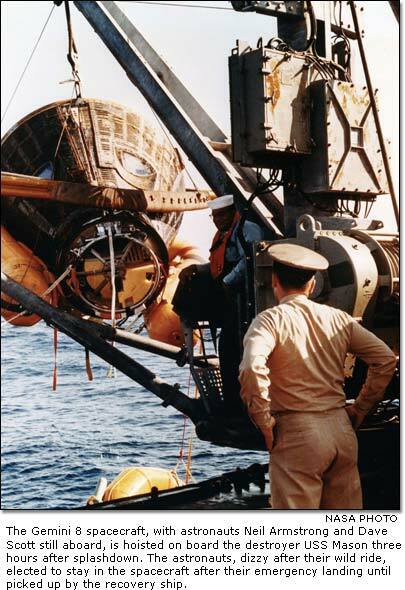 A few minutes later, Gemini 8 plunged safely into the Pacific. Eleven hours after launch from Cape Kennedy, Gemini 8 had made a near-perfect touchdown only a few miles from the center of the emergency landing point. A searching C-54 spotted the spacecraft suspended beneath its giant red-and-white stripped parachute even before it hit the water. Within minutes the plane dropped a rescue team into the water. Three hours later the destroyer Mason arrived and welcomed Armstrong, Scott and Gemini 8 on board. The ship headed for Okinawa, some 400 miles away, where an Air Force transport plane waited to fly the astronauts to Houston. Despite the aborted mission and Gemini 8's brush with disaster, the flight had its rewards. The docking and undocking system worked, even under extreme conditions. NASA's first real life-and-death situation in space boosted the agency's confidence in its astronauts' ability to handle the unexpected. And the abrupt return to Earth proved that the Air Force–Navy worldwide rescue network could respond quickly to an emergency landing. "Maybe," said Robert Gilruth, NASA's top official at the time, "we have learned more today than we set out to learn."